This is the finished charcoal overcoat from Edward Sexton, and it’s hard to over-estimate how much pleasure it gives me. It’s a very different feeling from my navy Cifonelli coat. That is practical, every day, an anonymous touch of luxury. It goes with everything and I go everywhere with it. The Sexton coat is my idea of flamboyance. Not in colour, pattern or gimmicky design. But in weight, cut and beauty on a massive scale. I’ve had it for a couple of months, and there were only about three weeks in that time where it felt necessary in London. But as soon as you go to New York, or Toronto, as I did for events recently (posts at those links), every other coat feels like a pathetic gesture at protection. When each gust of wind is like ice on exposed skin, you feel very, very smug in this coat. Primarily, it’s a matter of length. I find it eternally frustrating that raincoats are never offered below the knee, and overcoats are only a little better. Yes, you feel the cold more on your torso. But legs get cold (and wet) too. Second it’s a matter of cloth – this 21-ounce golden bale/cashmere from Harrison’s. And third is the design: the big wrap-around of the double-breasted front and the tall collar. The former basically doubles the cloth up across the front of your body. That collar was the one thing we didn’t get right initially. Coats are cut – understandably – with the collar down. But I wear it up just as often, and it needs to stay there. So we doubled the canvas in the collar and, crucially, cut a separate crescent-shaped piece into the back to help support it (see pic above). Also important was the depth of the gorge – how deep that cut is between the collar and lapel. Unless the front is entirely buttoned up, the lapel is always going to pull at the collar and drag it down. So that was deepened slightly. Elsewhere, the make was absolutely perfect from the off. As mentioned in my original post, I wanted to use the curving seams of a paletot or tail coat on the back (I love the way they emphasise the shoulders and run into the sleeve seam) but disliked the horizontal cut usually used at the waist. So we came up with this design, where the two seams sweep down the back, and then turn into pleats below the waist. It took a little tweaking with the depth and position of those pleats, to make sure they stayed closed, but the end result is – I hope you’ll agree – wonderfully dramatic. Elsewhere a lot of the superb finishing work done by Sexton’s team goes almost unnoticed. The swelled edge all the way down the length of this coat, for example, took the maker all afternoon. And the buttonholes are beautiful: fine, deep (given the cloth) and in many cases double-sided, so you see a finished hole whether the coat is fastened across the chest or not. Again, one of those double-sided buttonholes takes a couple of hours to do. Stylistically, I think the structure of Edward’s cutting really suits a coat of this length. The shoulders and the roping of the sleevehead, for example, work here where a softer cut would leave the whole thing rather sloppy and lifeless. The turn-back cuffs – and the equally wide slanted pocket flaps – balance the drama of the collar and shoulders. My favourite style of buttoning the coat is just the one, waist button fastened and the lapel rolling beautifully down before flaring out in the skirt. We also took a few shots of the coat in movement here, because its length is given full expression when you’re striding along the street. As ever, click on the images to enlarge them. You can follow the discussion on Edward Sexton long overcoat – finished by entering your email address in the box below. You will then receive an email every time a new comment is added. These will also contain a link to a page where you can stop the alerts, and remove all of your related data from the site. Not convinced by the light coloured hat. With the right weather, would be fabulous with your fur hat. Very dramatic with more than a touch of a Russian military line. Yes, he looks rather like Tsar Nicholas II in pictures seven and eight, don’t you think? Ok, now I’m officially jealous! Superb. A truly unique piece. 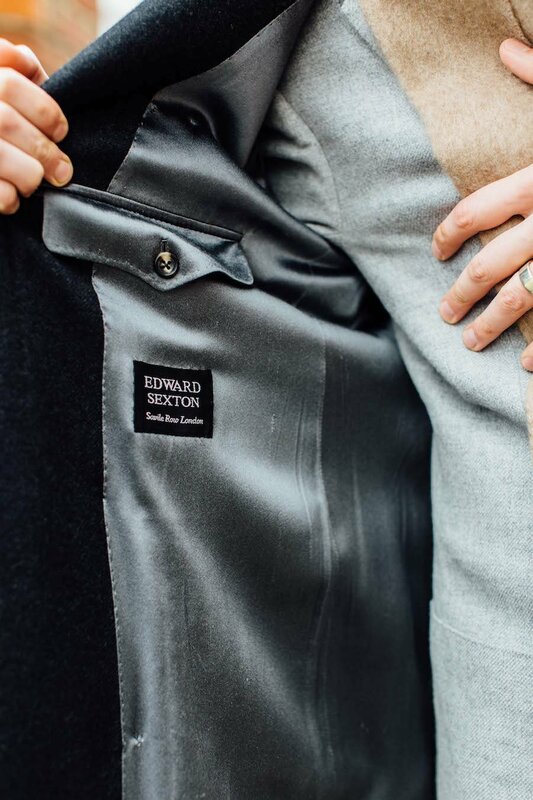 I smile every time I see Savile Row on one of Edward’s garments though. 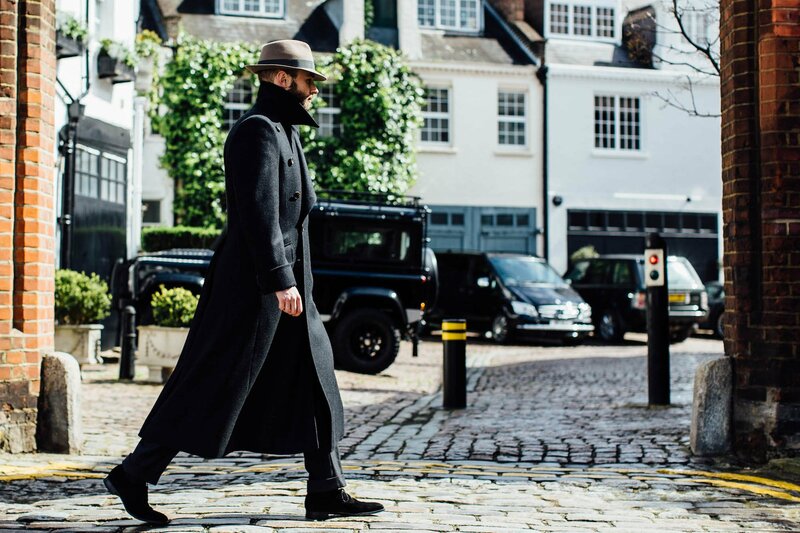 I agree – more than a nod to military heritage of the great coat. You’re right to be pleased Simon. It looks perfect. Amazing piece..
Ah yes. That is sublime. What a stunning coat. Practical in keeping out the elements but looks beautiful too. Particularly the line through the waist and flair below. There should be more coats of this length available; far too many mimic jackets at the moment and hardly cover the legs. PS About the hat. My immediate reaction was that it looks great; quite a tonal contrast with the rest of the outfit but to me suits that coat wonderfully. Thanks. We deliberately used a grey band rather than a brown to enable it to be worn with coats like this. And the final two photos have that lighter beige tone in the scarf that brings out the hat tone as well. Love that patterned scarf with the coat too. Beautifully made and with a military influence mixed with the theatrical, a very dramatic end result. Beautiful coat. Truly superb piece of tailoring. Re hat; i like it. Source, if you don’t mind. In the bottom of the post…. Hi M and Simon, sorry for repying such on old comment but I’m in a similar situation as my height is 1.71m. I bought a Burberry trech coat with the length of approx. 98cm and I found it perfectly suitable for my height. For this height, I would recommend any coat with a length around 100cm. Simon, It really looks awesome. the structured shoulder fit the length well and you look really great in it. Btw, May I know how tall you are ? this length fit you so well! I have been looking forward to this post a lot, ever since you first hinted about it a while ago. I love coats, I think I am one of the few people who look forward to winter as it gives me a chance to wear my coats. I think your right about the structure, a less strong shoulder and collar would make it look to floppy and perhaps a bit 80’s. The detailing is sublime. Possibly it is a little theatrical for every day where, but then I think the coat is meant to have a certain presence. It looks like a military greatcoat of an aristocrat of high level officer of past years. Incredible, absolute masterpiece, your best coat so far!! Love the shade of charcoal, has a nice blueish tinge that lighten’s it, not at all drab. Lovely coat aside, that’s a beautiful hat. I am speechless, Simon. And jealous. By the way, could we get some front shots with the collar down? I would like to see what it looks like. May be its too much. For you, how does this piece compare and contrast with your pea coat from Gieves? Any plans for an overcoat from Chittlebrough and Morgan? Wow! What a coat! This is the real thing I haven’t seen for years! I can only hope this one would be a little helpful to RTW coatmakers to eventually understand once and for all that short coats or raincoats are neither stylish nor practical. Now that you have this great coat made, you could plan an event in Moscow for next Winter. And don’t worry, they wouldn’t mistake it for a 1940s one you have just made altered, even if on the face of it, they might think of military coats of that era! How does the new Edward Green last compare to the 888 model? Is it noticeably slimmer, or more chiselled? Beautiful, Sexton’s work is superb. The cut and 10 button double breasted front is redolent of WW2 British Navy Great Coats (possibly cut by Gieves in the day) however the cutting of the back, collar and shaped front takes it to another level. A pair of heavier boots (Russian hunting boots?) and the fur hat that have (info?) would take you anywhere in Winter. Could you add some detail on the green foulard scarf you swear in a few of the pics? Congratulations to you and Edward. Well made, but it makes you look a little like a character in “Hawksmoor”. Such a fabulous piece. In my humble opinion I believe the Sexton cut suits you very well indeed. How about an informal raglan sleeved tweed next? Perhaps, yes. Though as I’ve said elsewhere, I’m not a huge fan of the style – and more importantly, there is much less point having it bespoke. There is no shoulder, no waist, and on top of that it’s actually harder for a tailor to cut. Simon, an off-topic ‘financial’ question for you. As you have mentioned several times in your articles, blogs and social media have dramatically helped the bespoke industry over the past few years to gain new customers and more importantly to better explain their value proposition. As a result, I have noticed that tailors have been pushing prices quite a bit when I compare for example the prices quoted in your earlier commissions vs. the ones you would have to pay today (classic demand and supply balance…). This is probably partly explained by increased marketing efforts / travels (although nothing to compare to big brands) and perhaps some pass-through of raw materials but it is certainly more attributable to ‘pricing’ power as demand is significantly up and customers are willing to pay for the rarity and uniqueness of the product. Depending on the tailor, prices probably increase somewhere between 5% and 15% year-on-year, which compounds pretty quickly as you are paying a few thousand pounds per commission. From your experience, are these price increases applied homogeneously across all the customer base or are you less likely to face a steep increase if you are a loyal and recurring customer? How did this work out for you with the tailors you have been using for a few years and is there a way to ‘protect’ yourself from the high inflation (beyond the easy answer to front-load commissions as early as possible…)? Hey. I find they are pretty consistent across customers to be honest. Very regular and loyal ones might have a shout, but that’s about it. Prices have definitely been going up, but given the number that were going out of business five years ago, it’s hard to resent it too much. 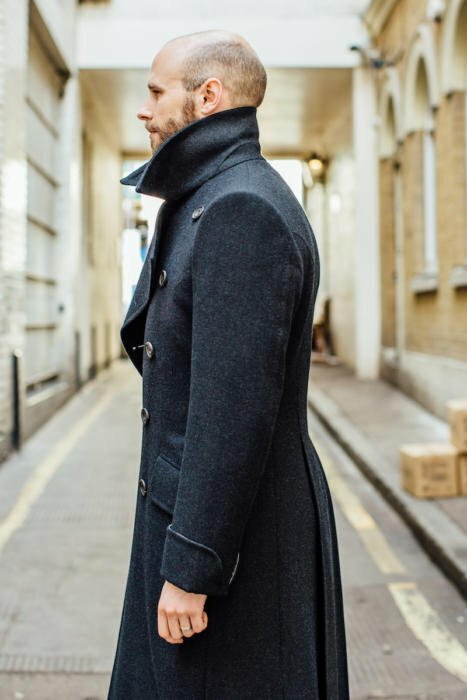 Just ramdomly found this article and Oh my God the best looking coat I have ever seen! Beautifully made and yet totally practical for cold winter! This gentleman M raised a very good question that has been lingering in my mind for long time. Things especially fine things are getting a lot more expensive year by year while my salary doesn’t go up or in fact it goes down with steep inflation. Wonder if I were to commission the exact same coat at Sexton now in 2018, how much would it cost? Probably a £1000 more? It makes bespoke tailoring continue to be out of reach for the majority of men, we then have no choice but to continue to buy and suffer from the poor quality of most RTW brands. Is bespoke tailoring business ultimately solely just dependent on rich clients? I can imagine when the next financial crisis comes, and it will come, these businesses would probably once again face the same problem as their clientele is so narrow. People would still go to buy Zara and H&M though. Then again, should I start saving up $$$ so when that financial tsunami once again hits, I could finally commission something at a bargain? Otherwise, I doubt I or most ordinary people would ever get a chance to wear such amazing coat. Unless you have so many, you end up selling some of them in the future. Good thought Calvin. In many ways, bespoke has been too cheap for quite a while, and many bespoke tailors have gone out of business because of this. They have small margins and only remained in business because of very long-term, repeat clients – of which there are now very few. I don’t think bespoke prices will ever go down, but they may stop going up. The Sexton coat would be pretty much the same price I think. I’m always impressed by the balance of these Edward Sexton pieces. Clothing this dramatic risks looking exaggerated and costumish. However the drama always seems balanced just right to prevent this. Maybe not an every-day overcoat, but doesn’t feel over the top either. I think you will find you have started a new trend with this overcoat. How different, how stylish and yet totally practical. The picture of the shoulder expands to the buttonhole picture when clicked. Lovely coat, Simon! Any chance we could see a shot from the front with the collar down. There is no doubt that this is a work of art but for me it is just too elaborate and I’d never wear it. For me it falls under the heading of “costume” and is the bespoke equivalent of catwalk. It could well be an inspiration for a more wearable version but unless I wanted to channel Jason King, I think I’d be leaving it in the wardrobe. Hi; first: what a fantastic coat! Now I’m wondering if you could advise on something lighter. Specifically I’m looking for a summer jacket/coat that could be worn over a suit or sports jacket. Something for when both a proper coat and even a lightly quilted jacket is just too warm, but walking around in an unstructured sports jacket is too cold. As I am very tall/lean I am hesitant to purchase a light material coat. Somehow I feel that it stretches my silhouette and gives an almost pervy look. I am also not feeling anything more sporty: A lot of outdoor brands produce fantastic functional jackets but they destroy any smartness in a look. I’m thinking of stereotypical businessmen in proper suits and ties all wearing trecking jackets. It’s a reverse-newscaster look in a way. Maybe you can help. Any ideas? Some of the tailoring houses have what they call a spring coat. It’s kind of a covert coat in a thinner but sturdy wool for cold mornings/evenings. That last one might be an option as well for the in between season, as you can buy it off the peg. A trench coat in cotton would work too, short or long depending on your walking/cycling/ driving habits. Esp. when you are long and tall the vertical elements (buttons, flap etc.) make your chest look wider. And it can be rolled up rather easily. It works for me unless it’s really bright weather and a rain coat seems out of place. It is very nice ……very Corto Maltese .I agree with Fred.I will show you mine as soon as I get from my tailors . Nice …….very Cort Maltese style. I agree with Fred .I will show you mine as soon as I get to my tailor. That’s my house you’re walking past there! Pop in for a coffee next time. Great coat! Love the website but this is the only time I will say it. The coat is wearing you, there is too much substance over the form, and one would need an ego of Joseph Stalin or Sherlock to pull something like this off. Stay with what suits your personality, wear it and don’t let “it” wear you. It’s been a few months since your finished WW2 spy coat was posted on the blog, and I’m sure you’ve seen ample use of this beautiful garment during your globe-trotting to the colder regions. What are your thoughts on this commission in retrospect, and are there any details you would care to improve/advise us to avoid? I’ve always admired your daring ventures into the unknown, e.g. with the gilet by David; but alas, some of us with limited financial means have lower tolerance for faults, and thus will have to rely on pioneers like you to shed some light onto their choices. I haven’t actually been able to wear it that much, but I am likely to get some length taken off it for this winter I think. It’ll make it that much easier to wear. A pity, but a bigger pity for it not to be worn. Interesting, Simon – care to enlighten us as to how the length of the coat is limiting its wearability please? And would that be the only complaint you have of this otherwise beautiful piece? Two questions if I may Simon. Firstly it’s not immediately apparent to me why you are shortening this coat. You mention the length adds drama and that a shorter length would make it easier to wear. Are you finding it is simply too dramatic to wear on a regular basis? Secondly I live in Switzerland, there are only 3 months a year where the average temperature is below 5C. Four months if you add in November which averages 5 degrees. 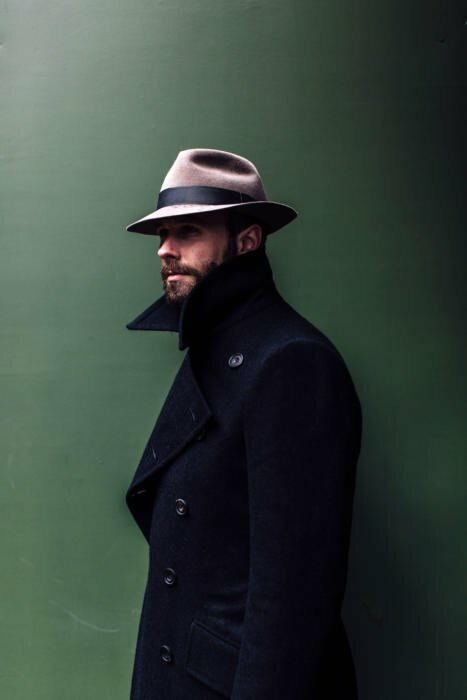 What weight cloth would you recommend for a similar coat that would drape in a similar manner but be something I could frequently feel the need for during our winters here? Thanks again for your blog – superb resource. Thanks. Yes, I find the length means it is too dramatic to wear often, and impractical sometimes – hard to handle if travelling, for example. 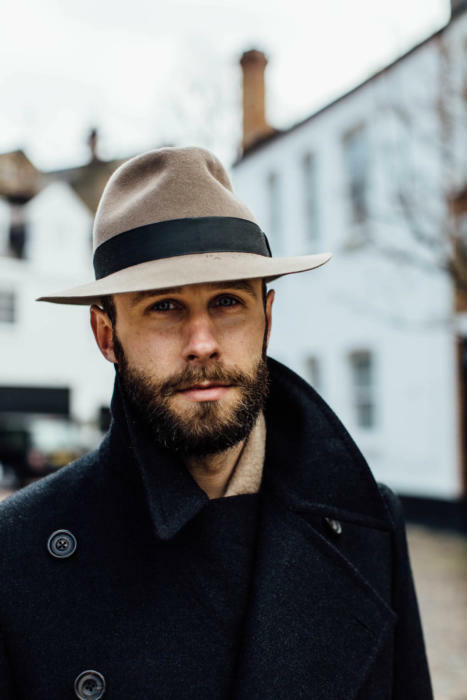 THis is the post that got me started on your blog, and when I had the chance to buy a vintage greatcoat by Gieves It all went rather quick. However, im still sort of in the proces of deciding whether to keep it. Some people remarked on the ‘Neo-esque’ quality; saying i look like i was in the matrix. 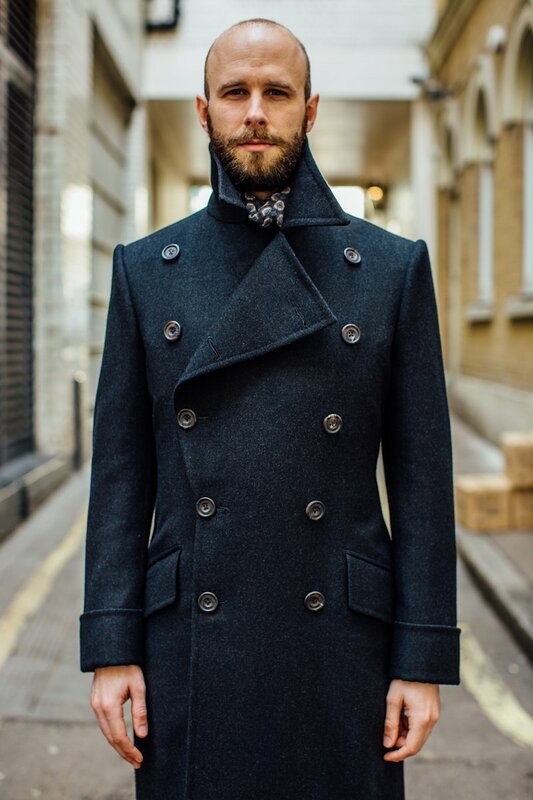 Despite the fact that it is a double breasted wide lapel type greatcoat. Have you had this remark? 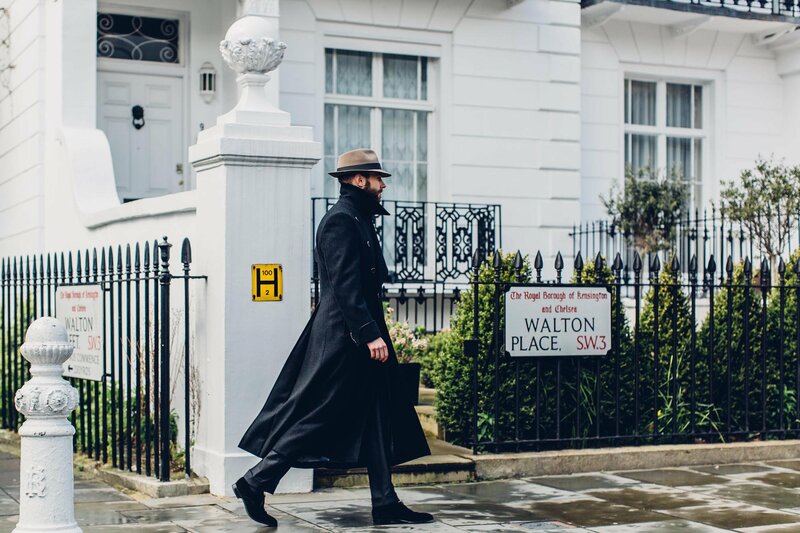 Simon I keep coming back to look at this piece – although I find it too dramatic for me I see many styling cues that appeal and I find myself thinking more and more about commissioning an overcoat. My issue is price, as both this piece and the Cifonelli are well out of my range. 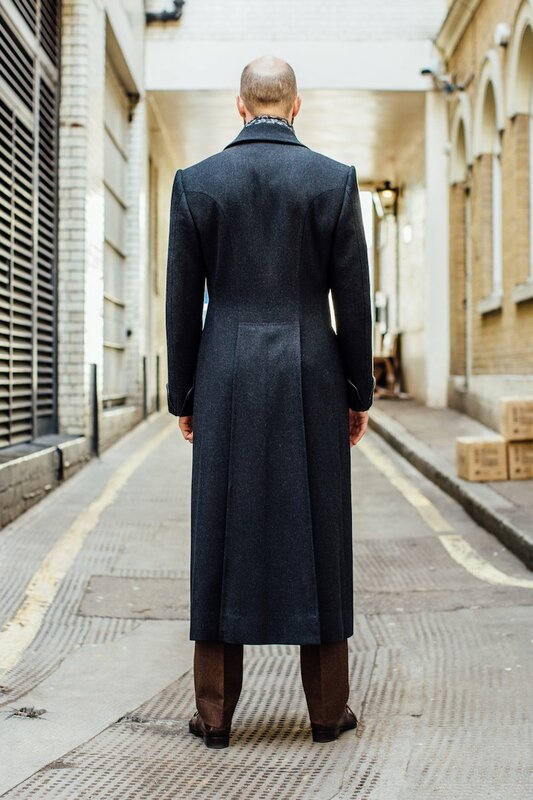 Do you have any thoughts on tailors who could do a nice overcoat at around the 2000£ mark? W&S perhaps? Now that is a coat. Sublime. 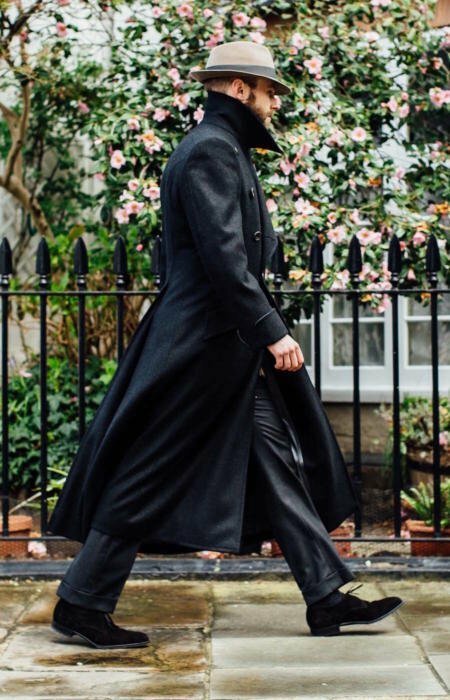 That is a wonderful coat – perhaps a little on the long side, but most modern coats err much too far in the opposite direction. It does, I think, call for a hat (like the grey one you’re wearing in some of the pictures) and probably gloves as well for the sake of “finish”; and if the weather is such that you need a coat like this one, it’s likely that you need a scarf, hat and gloves. This is just lovely. I know this post is a year old, but would it be possible to see a picture of the inside? At some point perhaps, yes. The lining was actually a heavy silk that I wouldn’t recommend – it catches and damages too easily. So not much to learn there. Has The City Milliner now closed permenantly? I wonder if you had this overcoat made for wearing layers (i.e. wearing outside of a blazer/jacket). If yes, how do you manage to have your overcoat fits perfectly with all your jacket/blazers, given that you have different jackets commissioned with different tailors? Yes, it is made to go over a jacket. And there is some need for compromise there: it needs to be a little bit tight on a very structured jacket, and a little bit loose on a very soft one, in order to sit well with both. It is a small challenge, however, compared to coats such as my Vergallo one, which was cut to be able to sit over both jackets and knitwear. That requires a slightly bigger compromise. Lovely coat and I love the button configuration but I wonder if you miss a breast-pocket? What would you recommend for a waterproof version of a great coat? Or can you recommend a good company that specialises in tailored waterproof greatcoats? I will be moving up to the Vega islands in Norway and i wonder how long a beautifully made great coat will last in very unpredictable weather, minus degrees and far from city life. Hi Simon, to what extent do you think the overcoat’s sleeve should be wider than that of the sport coat/suit coat? 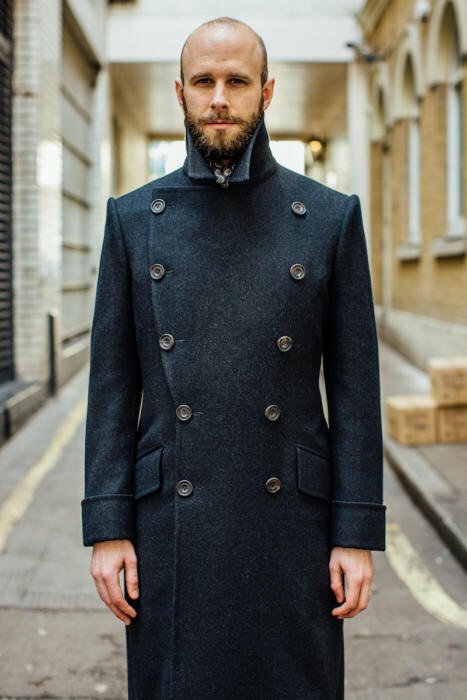 Really nice overcoat!I’m thinking of having one made but wondered why you chose a wool/cashmere cloth and not just pure cashmere. 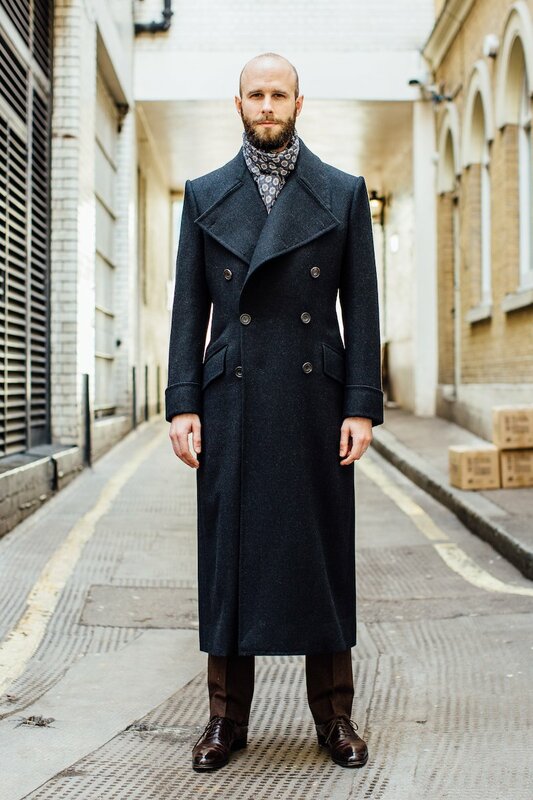 Hello Simon, This Edward Sexton long overcoat is beautiful. I love how dramatic it is. It seems to be quite snug-fitting around the shoulders and chest. I’m wondering how much room it allows you (with jacket, etc underneath) to raise your arms and move them around, for example when hugging someone, or reaching up with both hands, to a high shelf. The reason I am wondering is because I have just bought myself a similar-looking WW2 greatcoat; second hand, but incredibly well-preserved, and beautifully made. I believe it was tailor-made especially for a cavalry captain. I find myself questioning the fit of my new coat; in particular, I’m wondering just how snug it should be. I reckon I’ll mostly wear it with a T-shirt & medium thickness jumper, or occasionally just a shirt. It’s very warm and heavy (3.5kg). With the T-shirt & jumper underneath, and the coat fully buttoned up, it feels perfect with my arms straight down at my side. When I raise my arms in a hugging myself motion, it feels a little tight and restrictive. Is that normal for fitted jackets and coats? With my arms at my side, the fit seems very similar to yours. It sounds like this might have more to do with the weight rather than the fit, Arin. Imagine that same fit but with a cloth half the weight. I think you’d feel a lot less restricted. Ah, yes, bingo! I had not even considered that. I’ve certainly never worn anything even close to this weight, before. I think it’ll take a little getting used to. It’s also a little stiff. I have a feeling it was only worn a few times, and then carefully stored for 75 years. It actually feels quite new. I imagine the wool will soften, somewhat, with use, too. Thank you, Simon; I feel much better about it, already. 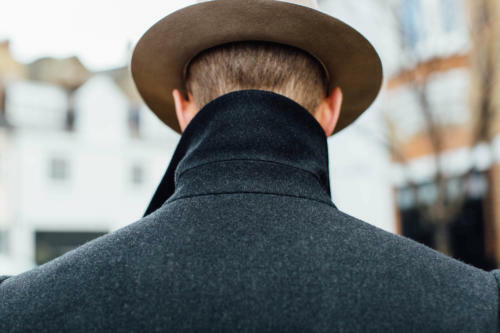 I just saw this coat on your last piece about the very nice Fedora from Stephen Temkin. This is probably the most extraordinary coat I’ve seen in a while. And I’m quite the stalker on Instagram, this blog and a carefully selected others, so that’s saying something. 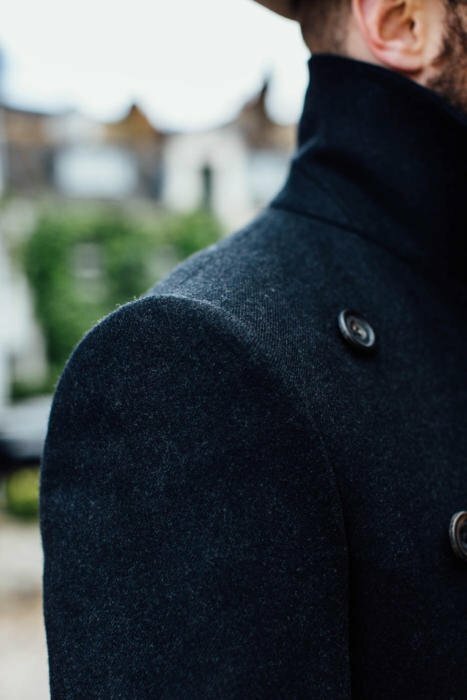 I know this thread is bit aged but I’m interested by the golden bale/cashmere Harrison’s fabric and I’m thinking to the navy version for a bespoke DB overcoat? What’s the feeling with this fabric? Does it drape and age well? No worries, I actively encourage comments on old posts. Would appreciate your thoughts as well? Have you ever tried ES’s ‘off shore bespoke’? And do you think it would be a good idea to have an overcoat made through it?